Change is inevitable—are you positioned to remain relevant with your future customer? 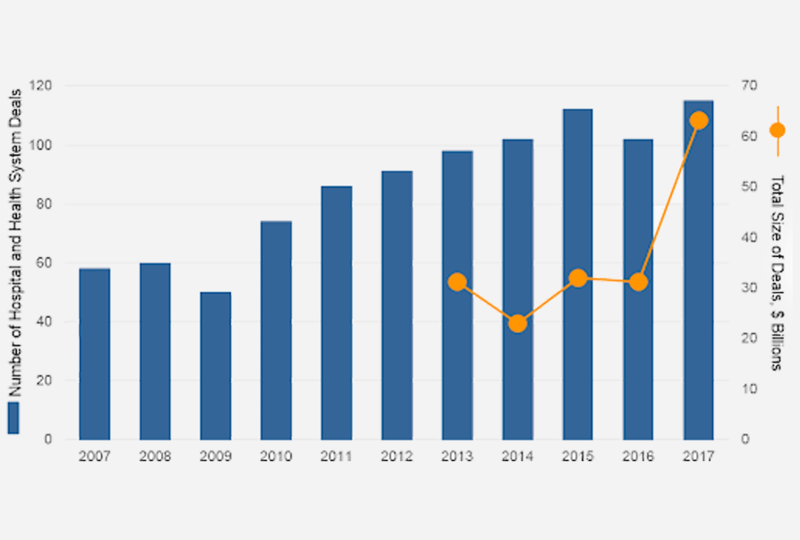 Merger and acquisition (M&A) activity across the healthcare industry continues to grow in terms of both the number and size of deals (Figure 1, below). While consolidation of hospitals and physician groups is not new, the vertical integration of non-traditional players (CVS–Aetna, Walmart–Humana–Kindred, Optum–DaVita Medical Group) demonstrates that no one is “staying in their lane” anymore. 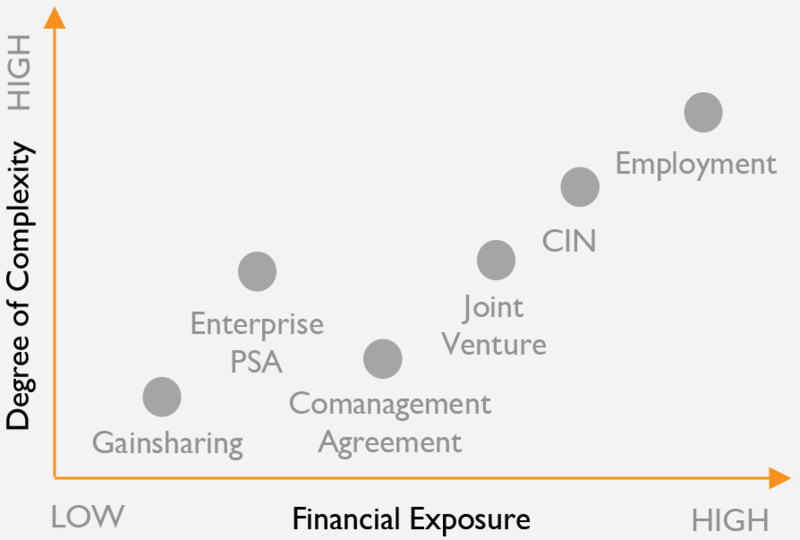 Additionally, the number of more complex and high-risk physician partnerships continue to grow (Figure 2, below). Additionally, the number of independent hospitals will continue to decline, as “too small to be sustainable” forces local health systems to seek acquisition by regional or national systems to ensure survival. 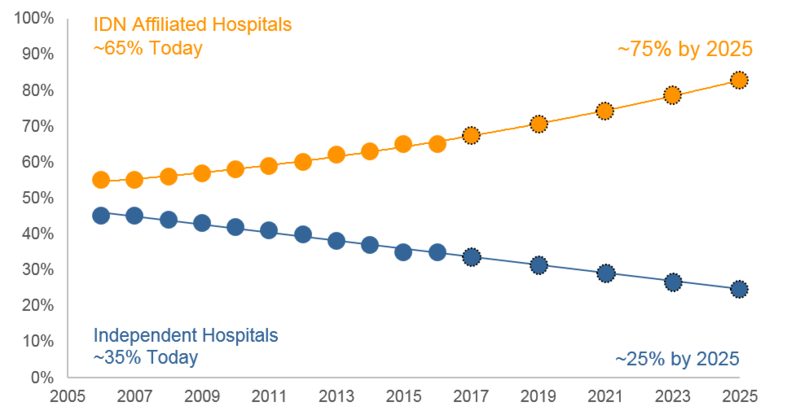 Hospitals will face significant financial challenges over the next 5 to 10 years as inpatient demand is flat to negative in most markets, growth in reimbursement fails to cover accelerating costs, and newly consolidated systems are challenged to drive improved productivity. Of importance to suppliers, large and growing IDNs will increasingly centralize purchasing decisions, removing waste and unnecessary spend that has limited clinical and economic value from the system. Experts estimate that one-third of current overall spend (~$1 trillion) today in the US health system is due to inefficient care as a result of fragmentation across care venues (with a combination of over- and under-use of care driving the majority of avoidable costs). The anticipated short-term impact of provider consolidation is likely to introduce further strategic (administrative), clinical, operational, and financial variability, putting pressure on these newly created entities to demonstrate sustainability. In addition, reports indicate that approximately $25 billion of supply chain waste is still present in the system. These 2 market pressures position IDNs to take advantage of a significant efficiency opportunity toward improved financial viability. Over time, select providers will become part of the IDNs that redefine the future of healthcare delivery in the US for decades to come. Trends in provider consolidation and value-based care will impact how healthcare providers adopt new technologies and divest those that fail to demonstrate value and a quantifiable impact on efficiency and patient/provider satisfaction. Two distinct phases are likely to develop over the next decade that carry important implications for suppliers’ business models (Figure 4). As the dust settles from the next decade of horizontal (eg, physician groups, ambulatory assets) and vertical (eg, acute care, health systems, retail firms, etc) consolidation, IDNs will make new purchasing decisions that align with value-based initiatives and that objectively consider and leverage stakeholder feedback. Recognize that product value will not always translate to customer value, especially as customers increasingly take on more risk-based payment arrangements and are measured on outcomes relative to total cost of care. Products will soon become commodities as cost savings gain advantage over physician preference items. Realize the opportunity to differentiate offerings through such services-around-the-product. Leverage the trend that sees providers increasingly moving toward dual- and single-source supplier arrangements and making trade-offs between product value, costs, innovation, and stakeholder preferences. Understand that comparative effectiveness and real-world internal data will replace traditional physician-driven decision making. 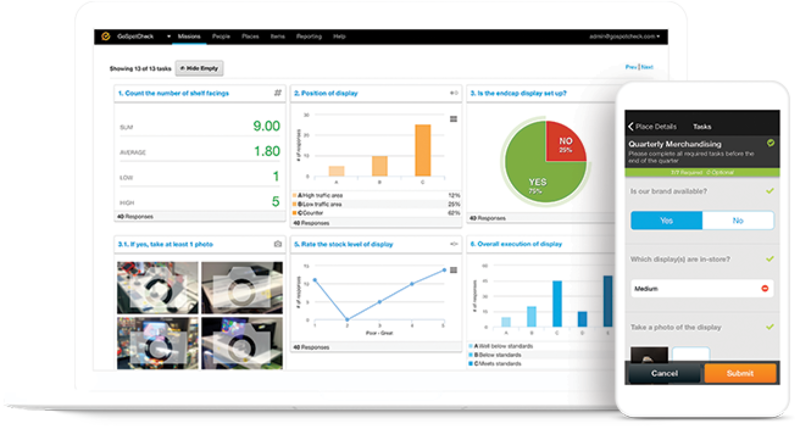 The role of the value analysis team will grow in importance and influence as the centralized decision-making entity makes system-wide decisions on what to keep in or remove from the supply chain. Recognize that advanced analytics will drive objective decision-making with the use of data aggregation and business intelligence solutions focused on performance improvement to reduce clinical, operational, and financial variability. Relationships need to evolve, and IDNs will be looking to work more intimately with suppliers that understand their business challenges, offer brand-agnostic services and solutions, and provide deep, meaningful insight into product use and stakeholder preferences. Adapt your offerings to engage IDNs under these new terms. 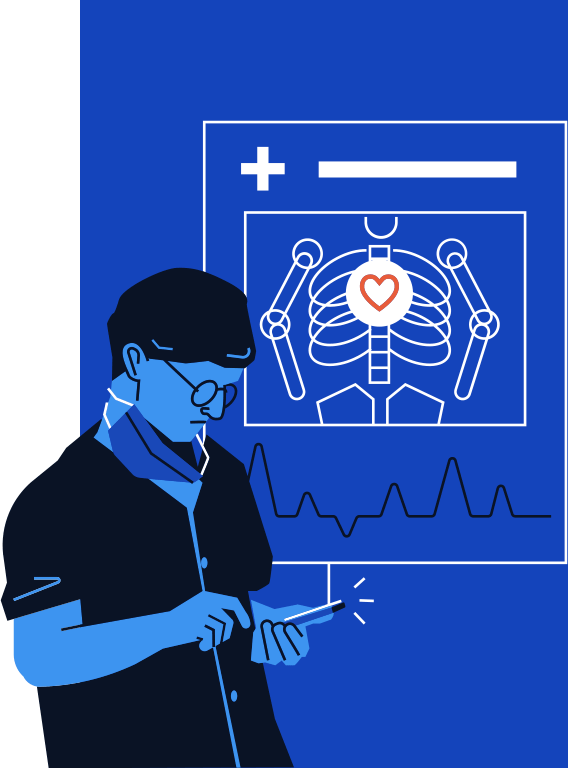 This article was written in collaboration with Sg2, a vendor-neutral strategy advisory consulting firm that helps healthcare organizations integrate, prioritize, and drive growth and performance across the continuum of care. The opinions expressed in this article are those of GoSpotCheck, and do not reflect an endorsement by Sg2. 2017 in Review: The Year M&A Shook the Healthcare Landscape, Kaufman Hall, 2018. Analysis of American Hospital Association Annual Survey data for community hospitals, 2014. Projecting Hospitals’ Profit Margins Under Several Illustrative Scenarios, Congressional Budget Office Working Paper, 2016. American Hospital Association Annual Survey, 2016; Sg2 Analysis, 2018.